Foursquare may have a tenuous partnership with Facebook Places— but don’t let the Kumbaya presentation fool you, these frenemies are gunning for the ultimate mayorship and Dennis Crowley is feeling very confident. On Friday’s taping of Gillmor Gang with former TechCrunchIT Editor Steve Gillmor, Kevin Marks and John Taschek, Crowley discussed the opportunity for places, outlined his plan for the next iteration of Foursquare and knocked Google for its social awkwardness. While his disgust with Google’s mismanagement of the ill-fated Dodgeball is well documented, in his explanation you don’t need to read between the lines to understand he’s also talking about Facebook and how he plans to beat Goliath. In a word, that’s what Crowley has brought to this undercover dogfight: fun. Although it may sound silly, Crowley’s argument is logically sound. The core of “fun” is his most potent weapon to staying relevant. Facebook is so huge (500 million large versus Foursquare’s 2.8 million) that its check-in service has to be simple and minimal to accommodate such a huge and diverse group— anything too quirky or outlandish runs the risk of alienating factions. While Foursquare cannot dream to compete with Facebook’s installed base, the startup can certainly differentiate itself by offering a creative, more dynamic product that is less utilitarian and more personality-driven. As Crowley explains on the Gillmor gang show, he does believe that Facebook has a major role to play in the location ecosystem. Facebook can aggregate check-ins from different services and introduce new users (millions upon millions of them) to the world of check-ins. Thus, if Facebook stays in its corner, the relationship could be a very symbiotic one for Foursquare, which saw a record number of sign-ups on Thursday. In other words, when it comes to the basic check-in, Facebook can be the king of the hill, but when it comes to creating the most engaging, valuable location experience, Crowley is ready for a fight. Facebook Connect came along and it really made the social graph open to everyone and makes building social apps easier. We think, oh, we are just building our social graphs on top of Facebook . 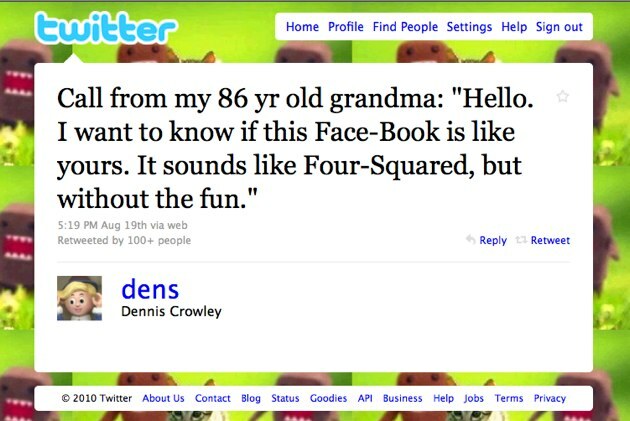 But Facebook could benefit from our social graph, and Facebook could benefit from Twitter’s social graph. You maybe are not just sucking data out of one, and that is the end of it, but maybe sucking data out of one and putting it in another and they are all working to make each other a little more powerful and a little more accurate.